Was back at Walmart looking for a deal I never did find. 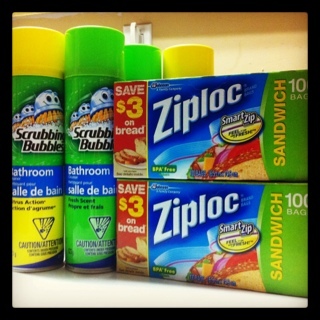 But I did decide to stalk up on some more Scrubbing Bubbles and Ziplock bags while I was there. I think I am well stocked in bathroom cleaner for at least two years now, seriously. So much bathroom cleaner. I did really need Ziplock bags but I use them lots and I had my coupon so I figure two boxes wouldn’t kill me. A week or two ago Canadian Tire had 40 count Ziplock bags on for $1.00 – perfect to be paired up with my $2.00 WUB2 coupon. But when I went to get them they were taking rain cheques because the order never came in. I put my name down but haven’t heard anything since. I do still have one coupon, so here is to hoping. Did this shop December 31, 2011. This entry was posted in b1g1, canadian coupons, coupons, free and tagged b1g1, canadian coupons, coupons, free on January 4, 2012 by Courtnie.